Situated in Redwater, this hotel is within a 10-minute walk of Discovery Well and Redwater Community Golf Course. Redwater Museum is 0.6 mi (0.9 km) away. Great swift service at check in and check out. Lots of breakfast options. I enjoyed the fitness room as well as the pool and hot tub area. 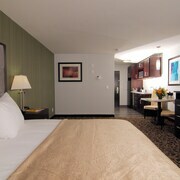 It was very clean as were the rooms. Everything was great. Where to find Redwater hotels near an airport? Where can I find hotels in Redwater that are near tourist attractions? Hotel options are limited within Redwater. There are, however, 2 Expedia-listed options within a 20-30 minute drive. 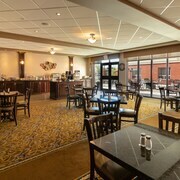 The The Kanata Inns, Alberta, which is the closest hotel, is located 30 kilometres (18 miles) from downtown Redwater. 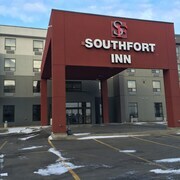 Another convenient alternative is the Hampton Inn Fort Saskatchewan, which is situated in Alberta, 30 kilometres (17 miles) from the center of Redwater. 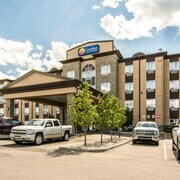 The Holiday Inn Express Hotel & Suites Fort Saskatchewan is positioned 30 kilometres (18 miles) from the middle of Redwater. 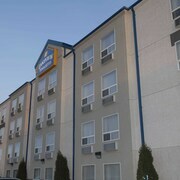 Or, alternatively, the Comfort Inn & Suites is located 30 kilometres (19 miles) away. 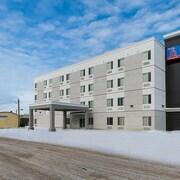 Some other accommodation options around Redwater are the Stars Inn & Suites Building B and the Stars Inn and Suites. Like to venture a little further afield? Central Alberta has many attractions. Admire Central Alberta's forests. In addition you could go to some of its old towns and archeological sites. Fun-loving travelers can enjoy snowboarding, skiing and cross-country skiing here. Leduc is 80 kilometres (49 miles) to the south of Redwater and is where you'll find Leduc Golf and Country Club and Maclab Centre for the Performing Arts. 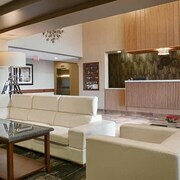 The Best Western Plus Denham Inn & Suites and Executive Hotel Alexandra are a few of the fabulous Expedia-listed hotel and apartment alternatives in Leduc. 45 kilometres (27 miles) to the southwest of Redwater, is St. Albert, home to the Best Western Plus The Inn At St. Albert and Sleep Inn Motel. The St. Albert Botanic Park and John E. Poole Boardwalk are some of the most popular places to experience while in St. Albert. Before you head home from Edmonton, why not make sure you catch local game. Visit Rexall Place to the south of Redwater. Those sports fans wanting to stay near to the sporting action can choose from the The Fairmont Hotel Macdonald or the Union Bank Inn. Edmonton International Airport can be found 75 kilometres (47 miles) away from Redwater. Travelers who choose to stay close by, can easily book a room via Expedia at the Ramada Edmonton International Airport or Executive Royal Hotel Edmonton Airport. 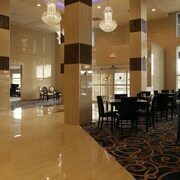 What are the most popular Redwater hotels? Are there hotels in other cities near Redwater? What other types of accommodations are available in Redwater? Explore Redwater with Expedia.ca’s Travel Guides to find the best flights, cars, holiday packages and more!